Visual Studio 2013 has the Page Inspector feature, which is really useful in debugging the 'look' of an app. Please enable this feature in Visual Studio 2015. Thanks for the feedback. Page Inspector has been deprecated in Visual Studio 2015 and replaced by Browser Link which solves a lot of the same use cases. I would prefer you complete remove the Sign In option, but at the very least make it 'Don't Show This Again' option or a context menu to hide it. The last thing I want to see is a Sign In button on the right hand side of Visual Studio, I clicked it trying to disable it and it expects me to sign in. First you add Tiles and ruin the desktop, if it wasn't for Classic Shell I would be back on Windows 7. If it wasn't for the tens of thousands of free software you (Microsoft) give me I would quit being a MS cheerleader. Thank you for providing this feedback. Unfortunately we are not able to address this suggestion so we are releasing the UserVoice votes to use on other topic. 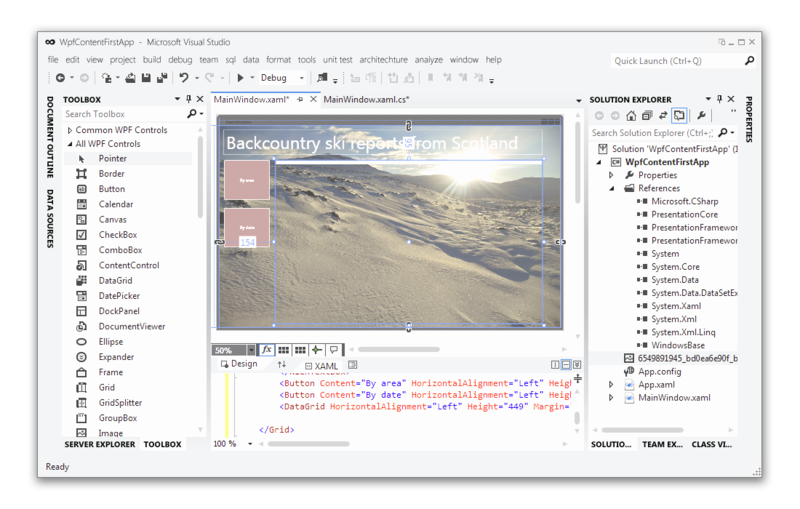 Users with a paid subscription can optionally sign in to the IDE or obtain a product key to unlock Visual Studio. Eligible MSDN subscribers can obtain a product key from the “Subscriber Downloads” section of http://msdn.com or from your organization’s volume license administrator. There are many features stuck in Ultimate that would incredibly useful to any developer, however Ultimate is simply financially unviable for many existing small businesses (where BizSpark don't qualify). The ability to buy individual features, like IntelliTrace, would provide developers with more reasonable means of acquiring these features, and Microsoft with income that would otherwise be nonexistent due to the exorbitant price of Ultimate. A user's snippet library can become quite an unruly place. Currently, the only way to add snippets that are not part of an extension or provided out of the box is to add them to your personal snippet library. At many organizations, you may be working in two or more solutions with many projects. It may be helpful to have code snippets defined--some of which only pertain to the current solution. However, the only recourse is to add them all to your personal snippet library. As a developer, I want to be able to add code snippets to a Visual Studio solution (and/or project?). Upon opening the solution or project, the snippets should become available to use (as if they were out-of-the-box snippets--alternatively, they could be namespaced by solution/project name) while that solution/project is open and active (and only avaiable in the instance of Visual Studio in which the solution/project containing the snippets is loaded). Once the solution/project is closed, the snippets are removed and are no longer available in other solutions/projects opened in that instance of Visual Studio. This will allow organizations to more easily share and reuse code snippets with very little user interaction, thereby increasing productivity. We have reviewed this and we do not plan to complete this suggestion in the foreseeable future since it has a relatively low level of support at this time, based on this item and other feedback channels. Intellisense crashes frequently on certain pages, leading to the frustrating scenario of having to close and reopen a page just to get intellisense working again. While it seems that you can't fix it, a simple way of quickly resetting it without having to close the tab, like you can with SQL Server, would make this frequent bug less annoying. This seems to have started happening in VS2012 and has got worse in VS2013 and you can see the extent of the problem on this SO post, with over 31,000 views in 1 year. Since the suggestion has been around for some time and not gained a lot of votes, I’m marking it declined at this time. It would be so much easier to work with T4 templates if we had the full intellisense experience. It's already really difficult to create code that generates code (my brain hurts sometimes) but without the rich editing experience that is normally available in VS is much much harder. I'm aware that there are extensions available but I'd rather not have to pay extra (and rely on a third party) to use the features that already exist in VS. Provide an option to display CodeLens beside declarations rather than above. CodeLens is extremely useful, but I don't like that it adds an extra [fractional] line which isn't really "there" into the visual flow of my code on the page. This is made worse by the fact that CodeLens takes a brief moment to load, so when a code file is first opened, it appears as if there are many extra blank lines (very obvious & distracting when these 'blank' CodeLens spaces appear beneath doc comments or attributes but above the declarations they decorate). If there were an option to display these annotations off to the right side of a declaration on the SAME line, I would prefer that layout. I recognize this presents some questions about what to do in the edge cases -- e.g., when a declaration and implementation are all squashed onto the same line -- but hey, that's software. We have reviewed this and we do not plan to complete this suggestion in the foreseeable future since it has a relatively low level of support based on this and other feedback channels.